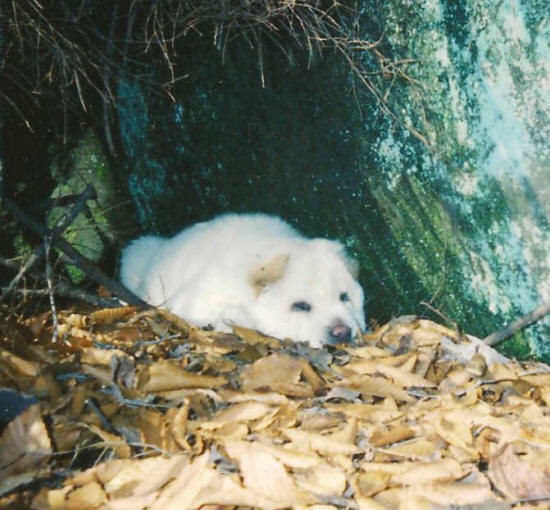 My own dogs were abandoned by their mother as puppies at the King Wildlife Sanctuary. They ate meat robustly and the white male developed hip dysplasia and his female sibling who is black and tan along with white Dwight also developed severe hair loss. The hip dysplasia was genetically passed on by the breed which is prone to it. They did not improve after several sorts of treatment, and then I became a vegetarian. They had lived on an all meat diet and some pancakes made with peanut butter flavoring for treats. When I switched them to all vegetables, they waited patiently for their dinners only to find they were looking at them. There wasn’t much interest! I then began to feed them a small amount of broth with pieces of cooked offal which is normally quickly discounted at our local grocery market. The offal consisted of chicken gizzards or livers and or trimmings from beef cuts. I hated to feed the dogs even meat by-products, but watching them starve wasn’t an option! Today, my offspring of a wild killer get a largely vegetarian diet. They devour every last cooked offering of carrots, celery, Swiss chard, potatoes, sweet potatoes, cabbage, corn, peas, squash, tomatoes, fruit and beans all of which are served abundantly. We usually vary their menu and their tails both wag while they are eating. I have been able to reduce the meat they consume by about 90%. Eventually, Lord willing and I live, I will try cutting down the amount of liver pieces, etc. to zero as they happily acclimate to the new food. Dwight has lost his hip dysphasia and both animals have glossy, beautiful coats. I can’t recommend a better way to feed your dogs if they were meat addicts. It took no special effort to get them to enjoy their vegetables but I may have to gradually introduce them to nothing but vegetables. I believe as they grow used to what they are now consuming they will eat it without the meat scrapes. I am already delighted with their progress. For treats, I give my dogs heated soy burger patties which they love or I make them elderberry pancakes. If you go online you will discover that elderberries are incredible foods. The dogs love Elderberry pancakes. You will find if you Google elderberries they have so many health benefits that many holistic doctors consider them to be perhaps the best berry on earth. Some rate elderberries even much higher than of the more exotic berries and fruits. They lower the LDL (bad cholesterol), they ward off, according to an Israeli study, types A and B of influenza and many other afflictions. Human beings often make a tea from the leaves to end headaches, arthritis or upper respiratory congestion and constipation. But never give your dog anything made from the leaves or bark because they can store up cyanide from the plant which can become injurious to them, the berries, however, are very beneficial. To make the pancakes, I mix up a one quart bowl of pancake batter; add a little stevia or applesauce to the batter along with the elderberries, up to one-half cup. This should provide treats for two large dogs (50lbs. or over) for one day. If your dogs are not yet used to a vegetarian diet, you can toss in a hot dog which has been run through the blender with a little liquid. Cook these like any other pancakes not much larger than a silver dollar and they will eat as many of these treats as leave your hand. To make these doggie pancakes can require five minutes per dog. Making your own homemade dog food can be a good investment in your furry friend and leaving your dog free to run the countryside can cause him or her to revert to their bad habits they have been secretly practicing since fallen mankind made his costly little agreement with the Devil! It began with Adam no longer caring for his position of serving the Creator and the entire creation. It digressed to Cane killing Abel. It degenerated to a world where we put down 4 million cats and dogs just in the US annually…which is one every eight seconds! Between help from God, vegetarianism, and loving care and education, we can reverse this trend. You can contact me with your comments on dog food or anything else at [email protected]. Victories are rarely won by standing alone. Your peaceful activism is profoundly appreciated.